Papua New Guinea Minister for Lands, Physical Planning, Urbanization and APEC 2018, . 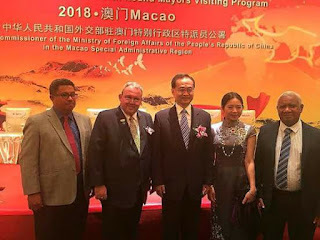 Justin W Tkatchenko with a delegation visited Macau in China during the 4th occasion for the Mayors Visiting Program. Minister Tkatchenko spoke highly of China and its support towards Papua New Guinea. On behalf of Prime Minister Hon Peter O’Neill, Hon Tkatchenko extended Papua New Guinea’s gratitude to the People’s Republic of China for over 40 years of formal and highly progressive relations, and well over 200 years of committed people to people relations between China and Papua New Guinea. He also added and expressed respect for the People of China especially from Southern China for seeing opportunities in places like Rabaul, Kokopo, Kavieng and Lae to invest for the Papua New Guinea’s growth. The occasion was to see connections and developing opportunities for countries, governments and cities. As Papua New Guinea prepares to host APEC 2018, China has also stepped in to lend its support.